The first day will begin with a photo stop at Zabeel Palace, the residence of Sheikh Mohammed bin Rashid Al Maktoum, prime minister and vice-president of the United Arab Emirates and Emir of Dubai. Our coach then take us to the Burj Khalifa, the tallest skyscraper in the world and an exhilarating ride in the lift at a speed of 10 metres per second, takes us up to the 124th floor where we can admire the 360° panoramic view of the city, the desert and the ocean. With our feet firmly back on the ground, we will have some free time for a stroll and to do some shopping at the Dubai Mall, considered the largest shopping centre in the world with 1,200 shops. Our next stop is the incredible sail shaped Burj Al Arab super-luxury hotel, which has become a symbol of Dubai. Our photo album of Dubai would not be complete without a reminder of this wonderful building and the coast of the Persian Gulf which frames it. After lunch, we set off to discover the old part of Dubai: the charm of the Al Bastakiya district, an area that has preserved its historic heritage dating back to the time when oil was first struck. The walls of the houses still enclose charming gardens where we can still catch a glimpse of decorations which once lavishly adorned them. The most intriguing part of these places is the presence of so-called barjeel towers: wind towers that rise above the rooftops channelling wind to the gardens and rooms below for cooling. These towers have become a symbol of the district. After visiting the Dubai Museum, not far from Al Bastakiya, we take an exciting boat ride across Dubai Creek in an abra, a wooden boat used as a river taxi. Spiced aromas and precious stones take centre stage at our next stop, the gold souk and the spice souk. The first day ends with the spectacular Dubai Fountain water and music show. This amazing 275-metre long fountain in the lake in front of the Burj Khalifa can shoot its water jets up to 150 metres in the air, as high as a 50-storey building. The second day will begin with a photo stop at the Jumeirah mosque. We then head to the Dubai International Financial Centre, Dubai's financial hub. Our tour continues in the direction of Palm Jumeirah, inaugurated by His Highness Sheikh Mohammed bin Rashid Al Maktoum as the eighth wonder of the world. Here the Atlantis hotel awaits us in all its glory. The enormous hotel complex houses a waterpark, a dolphinarium and an aquarium. The Lost Chambers aquarium is the perfect place for an imaginary adventure through the mysterious ruins of Atlantis and to admire over 65,000 marine species that live inside it. 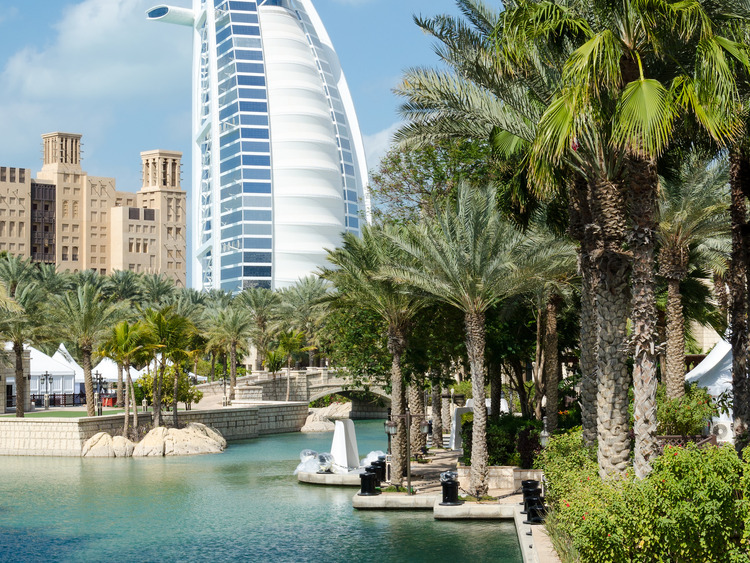 Our tour continues with a trip to the new Dubai Marina district with its fascinating, modern architecture, and subsequently ends at the Mall of the Emirates, the shopping centre that is famous for its 400-metre long ski slope. Being the BUrj Khalifa one of the main attractions of the city, there is the possibility of finding long queues at the entrance. The duration of the tour will be about 8 hours on the first day, after that, guests will come back on board, and the remaining 4 hours will be on the second day.